Great presentation from Ewan McIntosh done by combining his slides in slideshare and the audio from his keynote at the Tipperary Institute in May. The title of the talk - Unleashing The Tribe - references communities (online, mobile and face-to-face) and why it's important for educators, teaching and learning. I encourage you to follow Ewan's blog and two he follows - Clay Shirky, danah boyd. There's a lot of good stuff in this 25-minute slidecast. I, and many others, spend an inordinate amount of time promoting the integration of technology into teaching and learning. Although we still have much work to do, a lot of progress has been made in re-shaping teaching and learning. When I first listened to the podcast below, what really jumped out at me was how poorly most colleges are at using (leveraging) IT in other areas - particularly recruitment, admissions, registration, etc. We've implemented some of these advances into our operations, but for the most part these "innovations" live in their own silos. Consider the little "quiz" below. 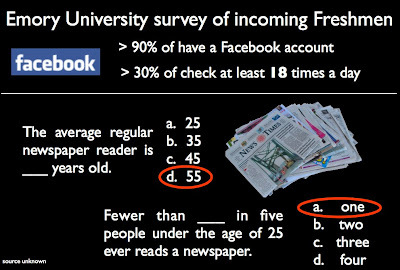 Students - traditional college-age students - don't read newspapers! As the statistics bear out, I don't even regularly read the newspaper. So what do we do? We print catalogs, schedules, letters, flyers, brochures, etc ... We drown these kids in - you guessed it - paper. For many colleges, the solution is a PDF version of the catalog. NEWFLASH people! Our students can see through this transparent attempt at technology. Instead of a drab, lifeless, static paper catalog, we're giving them a drab, lifeless, static online catalog. It's 2008 people. What are we waiting for? There's so much more we could be doing. We really should be taking a much more holistic approach where new technologies are woven throughout the fabric of a students experience with our institution. Do you know your Director of IT? Spend some time with him or her and begin to build a relationship. Everyone should know the Director of IT! From the Chronicle for Higher Education's Tech Therapy podcast. When it comes to recruiting students, college Web sites can be just as important as viewbooks and campus visits. So why don't colleges do more to put admissions directors and IT officers in the same room? Warren Arbogast, a technology consultant, talks with Scott Carlson, a Chronicle reporter. Things is a really slick task management application for Mac OS X. It's currently in preview release and is expected to be available Summer 2008 for $49 - a little pricey, when you consider that you can purchase either iLife or iWork for only $79. What's interesting about Things, is that the development team is working on a version - tentatively titled Things touch - for the iPhone and iPod Touch. Following the development and evolution of the an application for a new mobile platform is fascinating. 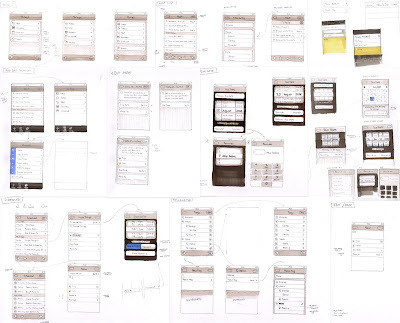 It's amazing to consider what's involved - just in laying out the storyboard below. See and read more here. 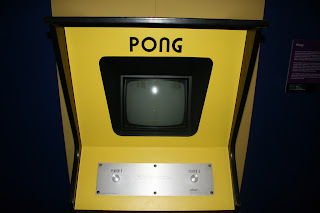 I remember pong as one of the first "real" video games. It's interesting that with the birth of a new computing platform - the iPhone and the iPhone SDK - we're coming full circle and pong returns. This requires a jailbroken iPhone - although, it could become a native app through the iTunes App store after June 9th. I don't think pong is the killer application for something like this, but opens up all sorts of possibilities for multi-user dynamic iPhone applications. Imagine kids on scavenger hunt or an environmental project, collecting data and being able to easily share it from device-to-device. I apologize in advance for the annoying guy who keeps making a "bong" noise - maybe you should mute! As a father of a teenage daughter, I'm glad to see that there are people focused on addressing this problem, but I'm disappointed to see how little progress has been made. It's particularly challenging when you consider all the initiatives that have been funded at the K-12 level and at colleges and universities can be undone with just one ignorant co-worker or supervisor. There's a great - but small - pool of fantastic female engineers and scientists that are tremendous role models for my daughter and others. Maybe what we need is better role models for our sons! Front Lines : Female Brain Drain in Science: "Much Has Yet to Happen"
After hours on the floor of the New York Stock Exchange Thursday, a group of mostly women gathered to drink wine and discuss new findings on the female brain drain in the fields of science, engineering and technology. Among them were the members of the “brain drain task force,” a group of researchers and executives from Cisco, Microsoft and other big-name companies who were behind a study — “The Athena Factor: Reversing the Brain Drain in Science, Engineering, and Technology” — discussed in the June issue of the Harvard Business Review. The study, conducted by the Center for Work-Life Policy, found that 52% of women working in science and tech left their jobs as they neared age 40. That attrition rate, all agreed, was too high. An interview Gordon Snyder and I did with Donna Milgram, Executive Director of Institute for Women in Trades, Technology & Science (www.iwitts.com , www.womentechworld.org ). Donna and IWITTS.com provide the tools to successfully integrate women into male-dominated careers via workshops, publications, products, e-strategies and technical assistance. Would you like to know if your efforts to recruit women to science, technology, engineering and math (STEM) are working? The STEM Equity Pipeline brings you a free one-hour webinar on "Building Effective Program Assessments: Adapting and Using Tools from the Assessing Women and Men in Engineering (AWE) Project" on June 16th at 2pm ET. More Online Teacher Training resources from the CalWomenTech Webinar series. Visit Whyville - a virtual city where kids show up as avatars and explore the different parts of Whyville, while learning scientific principles (for example, when visiting the Whyville Aeronautics and Space Administration (WASA) center, kids participate in space-related science activities). Read a study describing how Whyville is successful at attracting girls to science and technology. 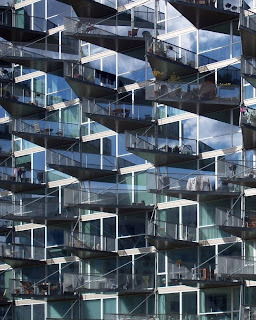 Earlier, I posted Living in Glass Houses, discussing the growing number of academic journals that are finding images that have been digitally altered. I also posted links to articles from Scientific American that describe the forensic science of examining photos for alteration and some techniques to help you spot a fake. A related post shows a slideshow of images altered throughout history. It's interesting to note how many of these are politically motivated. There's also a great example describing how a photo of Lance Armstrong has been altered. I'm two weeks out from having finished my grading for the semester. As the semester comes to a close, there's always discussion about students cheating - either copying someone's work or falsifying their work. It's not uncommon for a colleague to request that I look over some assignments or papers to weigh in on whether work has been copied, fudged or out-and-out faked. In fact, there's a growing market for tools to prevent (SynchronEyes) and identify (Turnitin) cheating and increased discussion regarding how to limit cheating in online and face-to-face courses. It's ironic, that the students who feel the need to cheat are often not very good at it. An even more disturbing trend is highlighted in the article below, from the Chronicle of Higher Education. It makes me wonder how faculty will maintain the moral high ground! And the level of tampering they find is alarming. iPhone 2.0 or Something More? what do you get when you cross an always connected communication device (like an iPhone 3G) with a super thin computer like a MacBook Air? Simple. You get the MacBook Touch (or here's a longshot - the iMac Air). A real computer connected to the web 24x7 with a touch interface sans keyboard. Throw in the new MobileMe (.Mac replacement) and you can get your tunes, photos, movies over the air wherever you are. (The iMac killed the floppy drive - perhaps this new tablet will kill the DVD.) And we're going to see this sooner than most people think. Another great video from CommonCraft - this one explaining Social Media. I've posted a number of CommonCraft videos in the past - they're simple. very effective explanations of often difficult Web 2.0 concepts. There are some developments at CommonCraft to share. The first is the CommonCraft Store, where users can purchase and download high quality versions (640 x 480 for most; 1280 x 720 for some) of their videos. Prices are $18.99 for an individual license and $349.99 for a site license. They are also offering the Social Media Six-Pack - 6 videos (RSS, Wikis, Social Networking, Social Bookmarking, Blogs and Twitter) for the price of 5 ($94.95 individual or $1,749.95 site). You can also view the custom videos they've done for their clients, including PRWeb, Google Docs, Wetpaint Wikis, MyGads, California School Finance, Vancouver's I-Move, Google's My Location for Mobile Maps, Redfin, Enerjy, H & R Block's Tango, and Google Apps with Salesforce.com. I've read that they charge $40,000 per custom video. With out further delay, here is Social Media in Plain English.